FOOTBALL fans the world over are looking forward to the Fifa World Cup next year. This international football tournament will be held in Russia from June 14 to July 15, 2018. 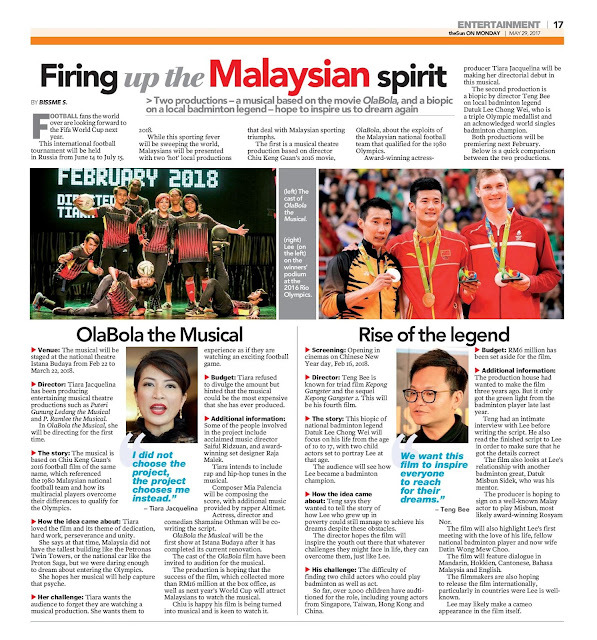 While this sporting fever will be sweeping the world, Malaysians will be presented with two ‘hot’ local productions that deal with Malaysian sporting triumphs. The first is a musical theatre production based on director Chiu Keng Guan’s 2016 movie, OlaBola, about the exploits of the Malaysian national football team that qualified for the 1980 Olympics. Award-winning actress producer Tiara Jacquelina will be making her directorial debut in this musical. 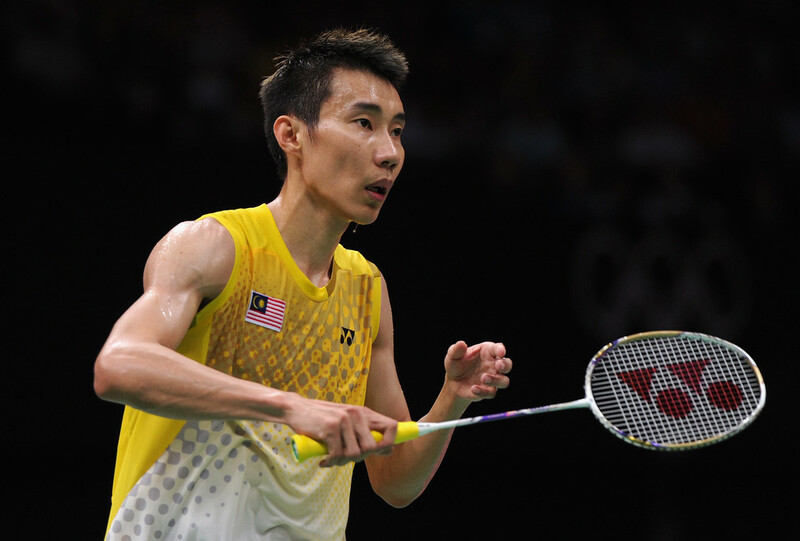 The second production is a biopic by director Teng Bee on local badminton legend Datuk Lee Chong Wei, who is a triple Olympic medallist and an acknowledged world singles badminton champion. Both productions will be premiering next February. Below is a quick comparison between the two productions. The musical will be staged at the national theatre Istana Budaya from Feb 22 to March 22, 2018. Tiara Jacquelina has been producing entertaining musical theatre productions such as Puteri Gunung Ledang the Musical and P. Ramlee the Musical. In OlaBola the Musical, she will be directing for the first time. 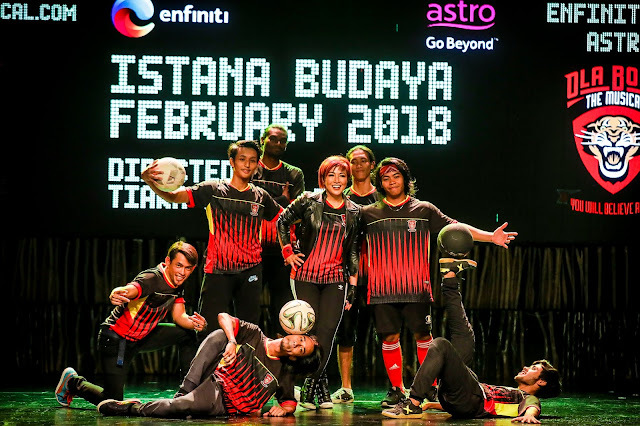 The musical is based on Chiu Keng Guan’s 2016 football film of the same name, which referenced the 1980 Malaysian national football team and how its multiracial players overcome their differences to qualify for the Olympics. Tiara loved the film and its theme of dedication, hard work, perseverance and unity. She says at that time, Malaysia did not have the tallest building like the Petronas Twin Towers, or the national car like the Proton Saga, but we were daring enough to dream about entering the Olympics. She hopes her musical will help capture that psyche. Tiara wants the audience to forget they are watching a musical production. She wants them to exprience OlaBola the Musical experience as if they are watching an exciting football game. Tiara refused to divulge the amount but hinted that the musical could be the most expensive that she has ever produced. Some of the people involved in the project include acclaimed music director Saiful Ridzuan, and awardwinning set designer Raja Malek. Tiara intends to include rap and hip-hop tunes in the musical. Composer Mia Palencia will be composing the score, with additional music provided by rapper Altimet. Actress, director and comedian Shamaine Othman will be cowriting the script. OlaBola the Musical will be the first show at Istana Budaya after it has completed its current renovation. The cast of the OlaBola film have been invited to audition for the musical. The production is hoping that the success of the film, which collected more than RM16 million at the box office, as well as next year’s World Cup will attract Malaysians to watch the musical. Chiu is happy his film is being turned into musical and is keen to watch it. Opening in cinemas on Chinese New Year day, Feb 16, 2018. Teng Bee is known for triad film Kepong Gangster and the sequel Kepong Gangster 2. This will be his fourth film. This biopic of national badminton legend Datuk Lee Chong Wei will focus on his life from the age of 10 to 17, with two child actors set to portray Lee at that age. The audience will see how Lee became a badminton champion. Teng says they wanted to tell the story of how Lee who grew up in poverty could still manage to achieve his dreams despite these obstacles. The director hopes the film will inspire the youth out there that whatever challenges they might face in life, they can overcome them, just like Lee. The difficulty of finding two child actors who could play badminton as well as act. So far, over 2,000 children have audtitioned for the role, including young actors from Singapore, Taiwan, Hong Kong and China. RM6 million has been set aside for the film. The production house had wanted to make the film three years ago. But it only got the green light from the badminton player late last year. Teng had an intimate interview with Lee before writing the script. He also read the finished script to Lee in order to make sure that he got the details correct. The film also looks at Lee’s relationship with another badminton great, Datuk Misbun Sidek, who was his mentor. The producer is hoping to sign on a well-known Malay actor to play Misbun, most likely award-winning Rosyam Nor. The film will also highlight Lee’s first meeting with the love of his life, fellow national badminton player and now wife Datin Wong Mew Choo. The film will feature dialogue in Mandarin, Hokkien, Cantonese, Bahasa Malaysia and English. The filmmakers are also hoping to release the film internationally, particularly in countries were Lee is wellknown. Lee may likely make a cameo appearance in the film itself.